Here’s another two ads that I grabbed in the last couple of months. Okay, let’s look at this one for a second. They’ve made the odd choice (like the dinosaur ad before it) to associate different levels of credit-score-having. In an apparent attempt to avoid my criticism from last time they’ve kept the animals from having expressions that might be mis-interpreted. Instead they all have the same flat, vacant expression, like they have no idea what they’re doing in a credit ad. Sadly, I have no explanations to offer them. What I do have is a questions – what’s the scale supposed to mean here? What does the highest point on the scale of credit correlate to in the animal kingdom? Popularity as a pet? Deliciousness when stir-fried? Adorableness? The first is a stretch, because rabbits just can’t compete with cats and dogs. The second is too disgusting to be the case, in fact I’m not sure why I brought it up. So it’s got to be the third, which is just crazy. I’m not going to get into the debate over cats and dogs, that’s an apples/oranges cuteness debate that we don’t have time to go over here. Instead I want to address the bigger problem with the ad – what’s the Panda doing at the bottom, associated with a bad credit score? Pandas and Bunnies are cuter than cats and dogs. 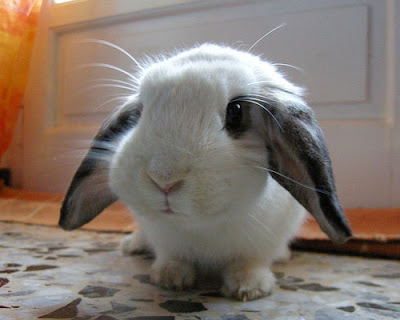 As proof, I offer two pictures from Google Image Searches for ‘cute bunny’ and ‘cute panda’. Now it’s debatable which of the two of those is the cutest (I’m a panda man myself), but they beat the hell out of kittens and puppies. If you wanted an animal that’s common enough for people to recognize but still identifiable as a negative thing, there are both gators and pigs to choose from. 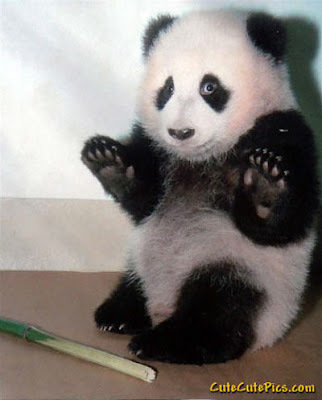 Why malign the noble panda? The second ad is even stranger. Yeah, while I applaud you for finding a justification for putting red at the top of the scale (poppies are, in fact, red), what’s going on with the rest of the scale? What is a yellow or orange poppy supposed to convey to me? And, again, what is the colour green doing at the bottom of the G-D scale? And why did I see a poppy-themed ad in June?